A.J. Lieberman and Al Barrionuevo did great work on Batman: Gotham Knights, and the atmosphere of that title carries over to Martian Manhunter: The Others Among Us. J'onn J'onzz's isolation is portrayed using the same kind of anti-hero sensibilities they applied to Hush and Prometheus; there's a fun conspiratory spy-versus-spy feel to this story. Lieberman does a nice job using a number of elements from J'onn's individual series and JLA storylines, making this story a continuation of the Martian Manhunter saga. The danger is only that for some readers, elements here may be so familiar as to seem ultimately predictable. I think writers oftentimes struggle with what exactly a "manhunter" is, and how to make J'onn J'onzz more than just a green Superman. Lieberman portrays J'onn here as the ultimate loner, still not completely embraced after years on earth because of his green skin; it's an obvious metaphor for issues of human difference, and it's a compelling interpretation of the character. Lieberman also introduces a healthy dose of government paranoia, in line with current DC Universe trends that we also see in The Battle for Bludhaven and Superman: Back in Action. As for "manhunting," much of the trade deals with J'onn out psychicly searching for clues to his latest predicament, and the rogue spy role is a good one for J'onn. 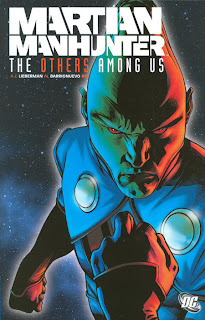 The Others Among Us is certainly built to launch Martian Manhunter into a new monthly series; I'm not convinced the character could support it, but I'm open to another miniseries by this team. Lieberman's story, however, remains constrained by the basic tenets of the Martian Manhunter's origins; that is, the last survivor of the planet Mars surviving on the planet Earth. Any attempt to change those facts would pretty much ruin the character, so from the beginning the survivors of Mars that J'onn finds seem destined to either die or turn on him. The answer harks back to a fairly well-mined JLA well-spring; but though the surprise is not all that surprising, I did like Lieberman's final "peace between the races" resolution. It was frustrating that The Others Among Us contains really no concrete explanation for the story's events in end; if anything, I'd be very happy to see The Others Among Us ultimately have ties to the origins of Miss Martian over in Teen Titans. I also wasn't convinced that Lieberman had the characterization quite right of the established DC characters that appear here (Alfred and Vixen, among others), though his J'onn J'onzz felt spot on.